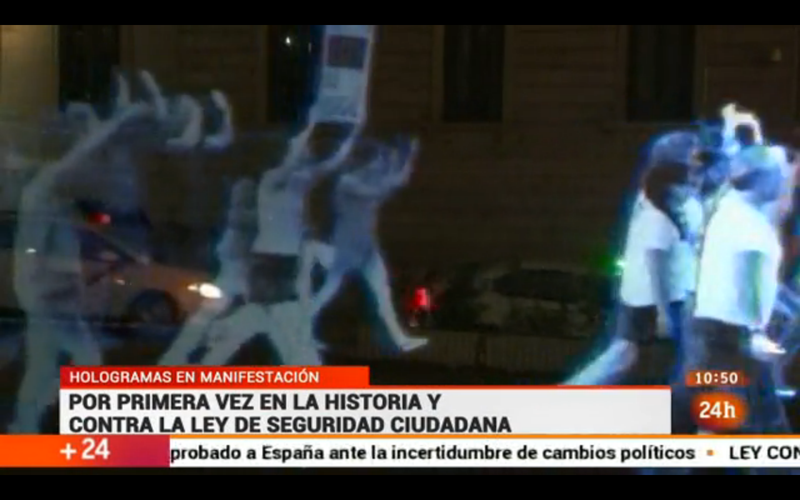 Following in the illuminated footsteps of noted iconoclast Tupac Shakur, a protest group in Spain took to the streets on Sunday—in hologram form. To the best of our knowledge it’s the first hologram political demonstration ever. Fusion reports that a group called No Somos Delito (“We Are Not a Crime”) are demonstrating against a series series of new “gag laws” that put heavy restrictions of freedom of expression. Included in the the so-called “citizen security” bills are 45 provisions that would outlaw many forms of expression, including public protest. The laws would go into effect on July 1st, if they standup to legal scrutiny. They are rightly seen as an egregious affront to personal liberty. The stunt is clearly an effective one in that we’re writing about it half-a-world away, an for once, it’s nice to see a hologram used for something more important than selling tickets to a concert in the desert.